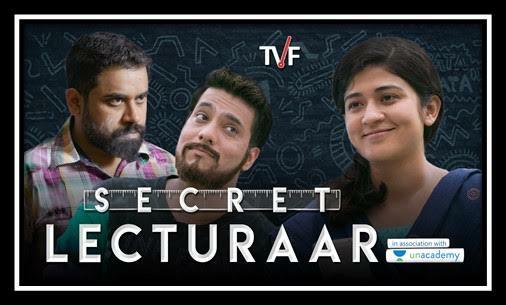 From the TVF stable, creators of the most compelling web content in India and makers of the immensely popular series like “TV Pitchers”, “Permanent roommates”, “TVF Tripling” amongst others, comes a heartfelt video “Secret Lecturaar”, which pays tribute to all the teachers on the occasion of Teacher’ Day. Drawing inspiration from the Aamir Khan’s upcoming film, ‘Secret Super Star’, ‘Secret Lecturaar’ narrates the story of a young teenage girl who has always revered her teachers more than her parents. Growing up she had posters of Sarvapaali Radha Krishnan on her walls and bowed not to Lord Rama or Krishna but to Bhagwaan Dronacharya. This perennial Pink-Floyd hater never leaves the kids alone because she is good at Mathematics and wants to root out Mathphobia from their tender minds. The video captures her aspirational journey as she faces a severe challenge when her dad objects to her career choice. He feels that teaching is a thankless job with no monetary incentive whatsoever. The girl, undeterred in her resolve, braves all barbs and beating to keep her dream alive. Soon she crosses path with a famous Professor who is a modern day Dronacharya and is applauded for his teaching prowess. The Professor motivates her and exposes her to Unacademy, a platform through which she can reach thousands of kids across the world and teach them. Through their interaction she realizes how Unacademy Educators are revolutionizing the world of teaching and soon gets sucked into this exciting world and ends up recording a video of her own. Still afraid of her dad’s tirade, she chooses to go anonymous. But her lectures turn out to be so awesome that she soon turns into a social media sensation albeit an anonymous one. All the students start referring to her as ‘Secret Lectur..aar’. ← Shubh Mangal Saavdhaan Movie Review: The Perfect Marriage of an Incredible Script & an Ensemble Cast!